60,000 Zip Codes rated. How climate-proof is your hometown? Are local regulations hurting future food supplies? Community Solar: No roof? No money? No problem. This statement describes how the Savvy Families Institute collects and uses the personal information you provide on our web site, www.144.208.68.48/~devclima. It also describes the choices available to you regarding our use of your personal information and how you can access and update this information. Collection and Use of Personal Information We currently collect or in the future may collect the following personal information from you: contact Information such as name, email address, mailing address, phone number. We may also collect information about your business such as company name, company size, business type. As is true of most Web sites, we also automatically gather information about your computer such as your IP address, browser type, referring/exit pages, and operating system. We may use this information to assess your needs to determine suitable products and topics, respond to customer service requests, or respond to your questions and concerns. We use a third party to place cookies on your computer to collect non-personally identifiable information to compile aggregated statistics for us about visitors and how they use our site. For example, we will know how many users access a specific page and which links they clicked on. We use this aggregated information to understand and optimize how our site is used. Links to Other Web Sites Our Site includes links to other web sites whose privacy practices may differ from those of the Savvy Families Institute. If you submit personal information to any of those sites, your information is governed by their privacy statements. We encourage you to carefully read the privacy statement of any web site you visit. Security The security of your personal information is important to us. We follow generally accepted industry standards to protect the personal information submitted to us, both during transmission and once we receive it. No method of transmission over the Internet, or method of electronic storage, is 100% secure, however. Therefore, we cannot guarantee its absolute security. If you have any questions about security on our web site, you can contact us at (401) 862-4534. Notification of Privacy Statement Changes We may update this privacy statement to reflect changes to our information practices. If we make any material changes we will notify you by means of a notice on this Site prior to the change becoming effective. We encourage you to periodically review this page for the latest information on our privacy practices. 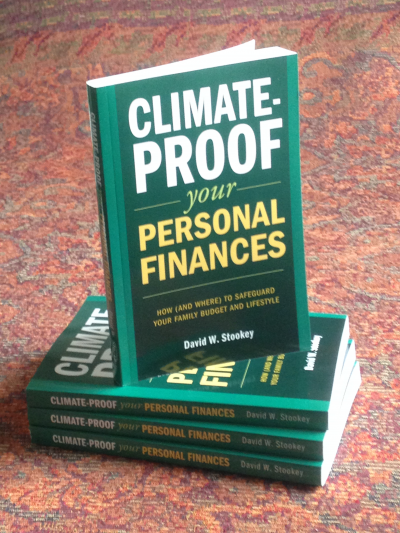 3) media users writing about our book, “Climate-Proof Your Personal Finances,” may use excerpts published on this website in the same manner as they would use excerpts from the book itself. About the data Data, indicators and evaluations used in our ratings have been obtained from publicly-available sources. These data and their sources are discussed on the Notes and Sources page, available with each report. Where appropriate, we offer a link to the source’s website. If the owners of any proprietary data used in our ratings feel that we are infringing their copyright or otherwise using the data improperly, please immediately let us know, online or using the contact information below, so we can remove the data from our ratings and remove our link to your website from our Notes and Sources page. About our ratings Our purpose is to provide you with the best quality comparative information, concentrating on the topics discussed throughout the Climate-Proof website. We try hard to eliminate errors and ambiguities from our ratings, but Where-To-Live Scorecards are provided “AS IS” without warranty of any kind, either express or implied, including, but not limited to, the implied warranties of accuracy, fitness for a particular purpose, or non-infringement. We are not responsible for any damages or losses arising from any use of this information. 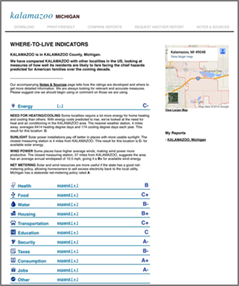 Limitations Our Where-To-Live Scorecards evaluate those aspects of places that relate to the financial, environmental, and social challenges discussed on the Climate-Proof website. You should, of course, take many additional factors into account when matching a community to your needs. How you can help Please contact us if you find a gap, error, or distortion in our data or our rating system. We count on your help to make Where-To-Live Scorecards as accurate and useful as possible.